"Phrasal verbs" are normal verbs! Re: "Phrasal verbs" are normal verbs! repl2 wrote: The point is that so called "phrasal verbs" (e.g. 'come in', 'come out') should be treated as "verb+postfix=new_verb". They are named "phrasal" because adding a preposition changes the meaning of the verb completely. 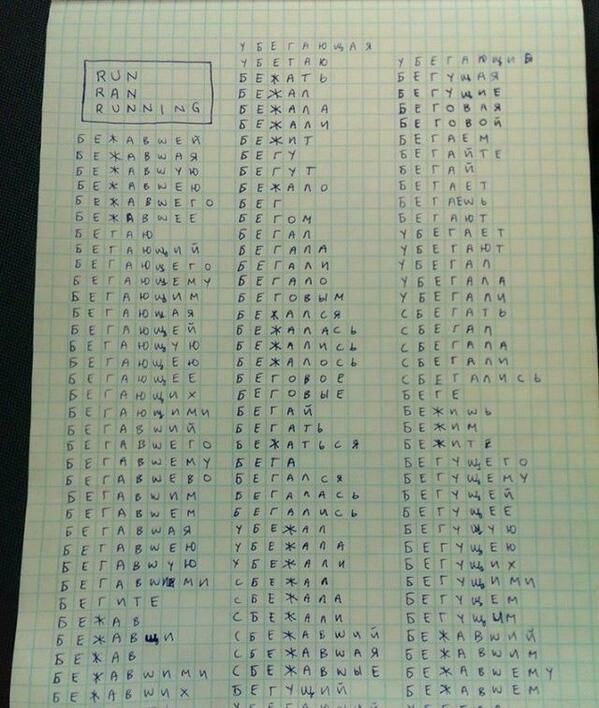 In Russian, if you know "бежать" (to run) and you know that "вы-" generally means "out", you can guess that "выбежать" means "run out (of some place)". In English, if you know "give" and you know "up", it doesn't help you to derive the meaning of "give up". You have to memorize it. That's the difference. Also, what does your attached picture have to do with phrasal verbs? voron wrote: In English, if you know "give" and you know "up", it doesn't help you to derive the meaning of "give up". You have to memorize it. That's the difference. So yes, they are normal verbs, once they become verbs. Or they become nouns (the fall-out). repl2 wrote: Взагалі важко щось viдповісти шизіку, в котрого на аватарці -- вовк, а нік -- крук. Ти лікуватися не пробував? Someone said they were abnormal?